As more and more advertising dollars flow into social media, some Madison Avenue firms are seeking to grab a piece of the action. But it will be a tough fight as the space is overrun with companies seeking to own the segment, from start-ups to public-relations firms. Universal McCann, the media-buying firm owned by Interpublic Group of Cos., is bolstering its social-media offering by launching a practice this week called Rally. The division will help marketers develop campaigns, track online chatter about their brands and measure how those campaigns perform. Headed by Heidi Browning, a former MySpace executive, Rally will house several new social-media hires. MySpace, like The Wall Street Journal, is owned by News Corp.
Publicis Groupe’s digital umbrella organization, Vivaki, says it also will open a social-media consulting practice by the end of the year. The new group will pool Publicis’ social-media tools and experts and use them to beef up the social-media practices that many of Publicis’ agencies have already established. Rishad Tobaccowala, chief strategy officer at Vivaki, says he is willing to use his mergers-and-acquisitions budget to bolster the practice if needed. The push to form a more formidable presence in social-media advertising is being fueled by the increasing number of marketers who are eager to figure out how they can use sites such as Facebook Inc., which has almost 500 million users, and Twitter, with more than 120 million registered users, as a marketing weapon. “Social media is now part of all our clients’ plans; we can’t not be in this space,” says Matt Seiler, chief executive of Universal McCann. Ad spending on social networks world-wide is expected to rise 14% this year to $2.5 billion, according to research firm eMarketer. Although social media represents only a fraction of the $55 billion online-ad market, it is one of the fastest-growing segments. Some corporations have taken a hands-on role in crafting their efforts: PepsiCo Inc.’s Gatorade, for example, recently created its “Mission Control Center,” which is set up like a broadcast-television control room and is charged with monitoring the sports drink around the clock across social-media networks. But as marketers look to make bigger commitments, they are increasingly seeking experts to navigate the burgeoning space. Earlier this year, Chrysler Group LLC tapped New Media Strategies, a unit of publisher Meredith Corp., to handle its social-media tasks. In March Kraft Foods Inc. hired 360i, a digital ad agency owned by Japan’s largest ad company, Dentsu Inc. 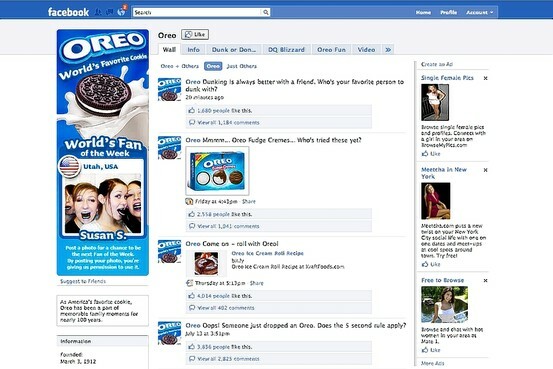 The agency has been tasked with monitoring the social-media sites for some of its brands such as Oreo and Jell-O. It also develops campaigns. The agency recently created the “World’s Fan of the Week” promotion that appears on Oreo’s Facebook page. Microsoft Corp. is currently searching for a social-media firm to handle duties for its Xbox videogame system, work that is now handled by several of Xbox’s agencies, according to people familiar with the matter. Asset-management firm State Street Corp. also has begun looking at firms. A spokeswoman for Microsoft declined to comment. “We have talked to some PR firms that appear to have established valid expertise over the years, and we are also interested in the new social-media firms that are bubbling up,” says Hannah Grove, State Street’s head of global marketing. Creative ad agencies, digital ad firms, social-media boutiques, public-relations outfits and publishing companies are all clambering to offer advice, all claiming to be best suited to handle the task. Analysts say many marketers are more interested in hiring smaller firms that have expertise in the field. Last year Domino’s Pizza Inc. hired New Media Strategies, a word-of-mouth marketing firm, as its agency of record for social media. “A lot of companies right now that specialize in PR or advertising are trying to do this on the side and the thing we liked in NMS is they specialize in social media,” said Chris Brandon, a spokesman for the pizza chain. Analysts and ad executives say the space won’t be dominated by small competitors for long because advertising holding companies and bigger public-relations firms will likely ramp up acquiring the smaller boutique firms, much like they have done with other digital areas such as search advertising. “I do think this is the year for consolidation in social media,” says Ms. Browning, president of Universal McCann’s Rally unit.